Mali : Three people were killed and more than a dozen injured, when a rocket attacked in the region of northern Mali, specifically at the UN peacekeepers’ base in Kidal. The attack took lives of force personnel from Guinea. Another civilian who was present in the region also succumbed to the attack and lost his life. 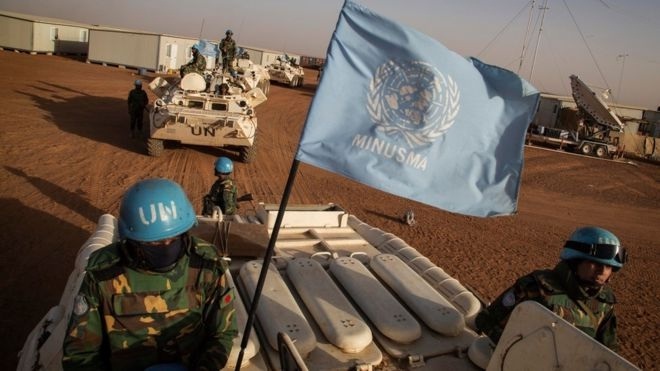 Two UN peacekeepers from Guinea and a civilian contractor were killed in the attack in Kidal which took place as a rocket was launched from the suspected Islamic militants wing. This is a continuation of a severe attack which took place eight days ago, during which gunmen attacked a hotel in the capital, Bamako, which resulted in taking of scores of people as hostage. The attack had caused fatality and nineteen people were killed. The peacekeeping mission in Mali has been functioning for over an year, as the mission was approved in 2014 after France led a military campaign to drive out Islamist militants from the north. The Minusma force — the bind of peacekeepers — comprises of over 10,000 soldiers, all personnel who have gathered together from dozens of different contributor countries. However, the majority of peacekeepers belong to Mali’s west African neighbors. This mission is categorized as one of world’s most dangerous peacekeeping mission. The UN mission which has faced severe criticism from some schools of thought since the time of its approval, simply for the basic reasoning that there is no peace deal to support the mission, has suffered more casualties than any other in recent years, with 56 troops killed so far.